In July 2014, Mike Rogers was given three months to live. He’d been diagnosed with mesothelioma, a rare and aggressive tissue cancer. But Rogers and wife Betty weren’t willing to accept the prognosis. The Anchorage, Alaska, couple started to research, finding a cardiothoracic surgeon and expert on treating mesothelioma seemed to be the answer to their prayers. The only problem: he was based in Los Angeles; the Rogers, live thousands of miles north. And Mike was too sick to travel alone. That’s when the Rogers learned of Angel Flight West – a nonprofit, volunteer-driven organization that arranges free air travel for people with serious medical conditions. For patients in Alaska, all flights are on Alaska Airlines, which has contributed more than $12 million in in-kind donations to the organization since 1986. Want to help? Donate miles today, by visiting alaskaair.com/charitymiles and selecting Angel Flight West from the drop-down menu. Mike and his caregivers have now taken 11 flights with Alaska and Angel Flight West, for consultations, treatments and surgery. Several weeks ago, he returned to Los Angeles for follow-up tests and received some amazing news. Angel Flight aims to eliminate transportation as a barrier to health care by providing free flights to patients within 13 western states. Alaska Airlines provides commercial medical travel, and Alaska and its Mileage Plan members donate thousands of miles each year for compassion travel. In addition to Charity Miles donations, Alaska provides about 900 tickets each year. Outside the state of Alaska, most Angel Flight West missions are flown by volunteer pilots donating their time and aircraft. Capt. Bob Brahm during an Angel Flight West mission. Retired Alaska Airlines Captain Bob Brahm is one of Angel Flight West’s volunteer pilots, flying three to five missions per year in his Cessna 182. He still remembers his first mission, flying a woman with cancer home to Crescent City, California. When he called the woman to arrange the flight, she burst into tears. Before Brahm’s call, she didn’t know how she was going to get home. 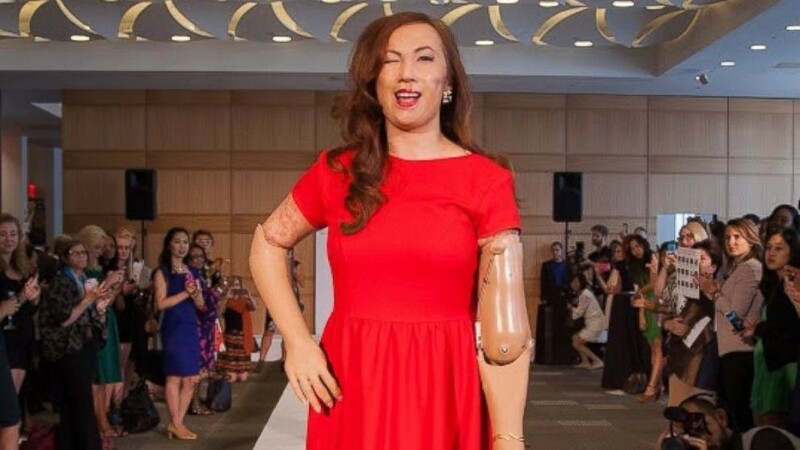 Karen Crespo made headlines in 2014 as the first-ever quadruple amputee to walk at New York Fashion Week. Los Angeles-area native Karen Crespo has been traveling with Angel Flight West since 2011, when she contracted a deadly form of bacterial meningitis. Within weeks of falling ill, the healthy young nurse’s life had completely changed. Doctors had to amputate all four of her limbs to stop the spread of gangrene. She lost her nose, survived heart attacks and spent five months in the hospital. “I had to relearn how to do the basic things that I did every day for the first 28 years of my life,” says Crespo. Crespo spent seven months in rehabilitation, but when doctors recommended she see experts in Chicago, specializing in rehabilitation for quadruple-amputees, the prospects looked dim. After months of medical care, and Crespo’s mother leaving her job to provide full-time care for her daughter, the money just wasn’t there – but Angel Flight West was. Crespo and her mother have now taken three flights with Angel Flight West, each time on Alaska Airlines using tickets and miles donated by Alaska and its Mileage Plan members. For the first year and a half after Crespo got sick, she was depressed and embarrassed and didn’t even want to see her friends. Now, she’s a vocal advocate for awareness and education around meningitis. “I lost all my limbs but I’m not going to let my disability define who I am and my future. I don’t want to say I’m disabled, I want to say I’m enabled,” says Crespo. Donate miles today, by visiting alaskaair.com/charitymiles and selecting Angel Flight West from the drop-down menu. Learn more about Crespo’s journey at caringforkaren.com. Visit nmaus.org and get educated about meningitis.